The Kremlin diet (Moscow), one of the many varieties of diets that are widely known in Russia. It got its name due to the fact that it was mostly powerful people. And popular diet was allowed through in her products. Indeed, the diet in which you eat sausages, meat, cheese and many other products made a splash, people began to talk about it, be interested, use. Essentially, the diet is similar to diets Robert Atkins (officially called the Atkins system of nutrition). American cardiologist Robert Atkins developed a meal plan based on low carbohydrate intake. In Russia was created similar in the basic principle of the diet, known to all as the Kremlin. Unlike the American version, «Kremlevka» was less balanced and greatly simplified, bringing down its efficiency. Diet implies some sort of product hierarchy. Each product is endowed with a certain amount of conventional units (sometimes referred to as price), where each of the units is one gram of carbohydrates. For each standard unit is charged score. Following the nutrition program, it is important that the number of points does not exceed a specific allowance established at a particular stage of weight loss. Through this approach, the diet is relatively easy and even interesting to observe. The phrase the third, keeping the weight – limit consumption is 60 points. It is considered that going beyond this limit will inevitably lead to weight increase. To help those who find it difficult (or just too lazy) to independently calculate any diet, there have been many apps and programs perfectly cope with this task. In the course of the diet is also recommended to drink plenty of water. With the correct balance of water, reducing the load on the body. However, this suggestion is not new, and regardless of whether you are trying to lose weight or not, each person is strictly advised to drink at least half to two liters of water a day. It is strongly recommended to eat more vegetables and fruits. Virtually no limit the amount of meat consumed. But, abuse is also impossible, because a large amount of protein can increase nitrogen levels in the body. Is strictly prohibited sugar. Sugar has no benefits to the body, while it contains a huge amount of carbohydrates. 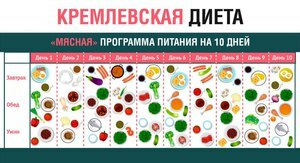 In the table of the Kremlin diet, sugar has 99 units, and therefore, using only 40 grams of sugar, you can spend an entire day’s diet. You can eat a whole chicken, and you still have free points for a snack. So you need to be ready mentally and physically for what will have to give up sugar forever. If in your case this is not possible, not worth starting, because the result can be the opposite. Supporting Moscow diet, you need to eat regularly and fully. You need at least twice a day firmly to eat, and preferably at the same time. Shot down meals, constant snacking disrupts the normal activity of the intestine, and this is something that should be avoided. Successful weight loss requires proper digestive system. Do not interfere, and a small exercise. Exhausting work is not mandatory, but a sport in the form of light will have a positive impact on metabolism. In the early stages, you may need medications that contain fiber. In schema-based diet is a chemical process that is called ketosis. This means that the system falls into the category of ketogenic diets which control insulin levels in the blood, causing glucose-insulin response. Actually ketosis is initiated by lowering the level of insulin in the body. Simply put, in the normal state, the human body uses glucose for energy. If the glucose level decreases to a certain position, then metabolic processes are rebuilt and are accumulated in the human body, fats. Due to the destruction of accumulated body reserves there is a weight loss. Pregnancy (it is strongly recommended to consult a doctor). Moscow diet is strict enough and long, therefore can significantly affect the functioning of the body. Before you make a decision on the observance of the Kremlin diet, you must pass a full examination and consult with your doctor. 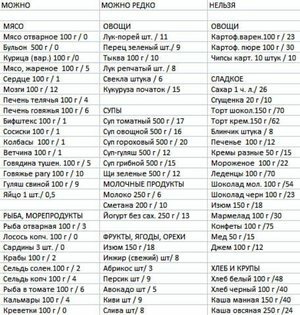 For the Kremlin diet was created by a graphic table that allows you to easily create a menu, and avoid the wrong products, see the figure below. Tiramisu (the price of 3.3 points per 10 g of food) — includes cream, eggs, coffee, gelatin. 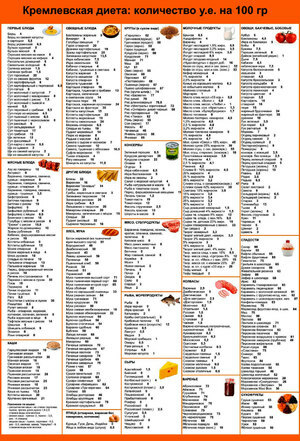 This is a short list of popular dishes that you can eat without damaging the diet. Very motivating and rich menu comes out. Despite its efficiency and wide fame, the diet gets very mixed reviews. Often people face problems. Most dieters are faced with low speed weight loss and fast it set in the case of a short pause. On this basis, we can say that a diet is only effective as long as the observed fully. If you eat something that goes beyond the «Kremlin hospital» will start immediately to gain weight, and may gain more than he had before sat on a diet. In fairness it should be noted that many still managed to lose weight and keep the desired result. These are the people for whom the diet has become a lifestyle. The popularity of the Kremlin diet is literally «forced» many magazines start publishing their own versions. Thanks to their hard work, diet was almost completely rethought. The authors have no relation to nutrition, do not hesitate to add your tips, notes, explanations and so on. Many publications completely misunderstood the essence of this power and was included in forbidden products such as sugar, flour, potatoes and others. Naturally, the effectiveness of the diet faded away and gradually people stopped her to use.